Presentations of Learning Begin Today! Presentations of Learning begin today! 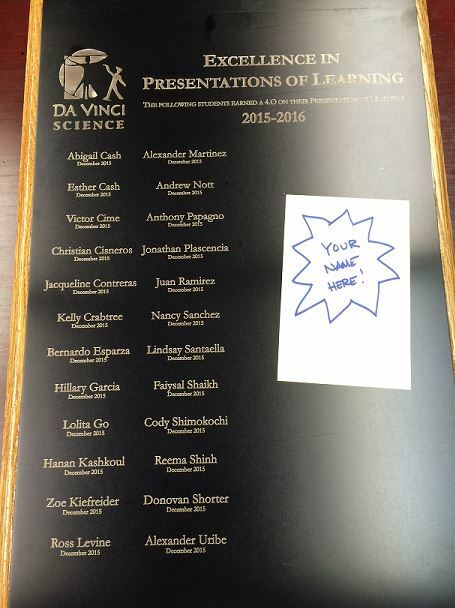 We can’t wait to see whose names will be added to the permanent achievement plaques! As a reminder, parents are expected to attend POLs. Please make sure to sign in at tinyurl.com/DVSParentParticipation when you come to support and listen to your student! Presentations of Learning start on Thursday of next week! Please make arrangements to attend at least one the two presentations your student will be giving to hear them talk about their learning, growth and mastery of the course concepts and the 21st Century Skills. The best way you can help them prepare for their POL is to be an audience for them to practice! The deadline for all student work submission is next Friday (5/27) at 4:00pm. Work submitted after this time will not be evaluated or considered as mastery evidence. Here is next week’s schedule – just 8 school days left until POLs begin! Thank you to all the mothers of our DVS students! We hope you feel appreciated and celebrated this Mothers’ Day Weekend! Here is the schedule for next week…Preparation for Presentations of Learning begins Monday! Week 33 is Teacher Appreciation Week! If you could take a few minutes to write notes of thanks to the teachers who have supported your kids, it would be a terrific encouragement to our teachers. You can drop them off at the front office or send them in with your student. Thank you! This is the last week of seminars before POL prep begins. POL Signup times go live on Wednesday evening, and students do not have school on Friday.